Hi Everyone and welcome back to another Menu Plan Monthly. Today I have my August Menu Plan for you. The following meals will get us through most of the month. I have left a few spots open for last minute recipes or for eating out. Any recipes noted with (New) are recipes I plan to make and will post in the near future. 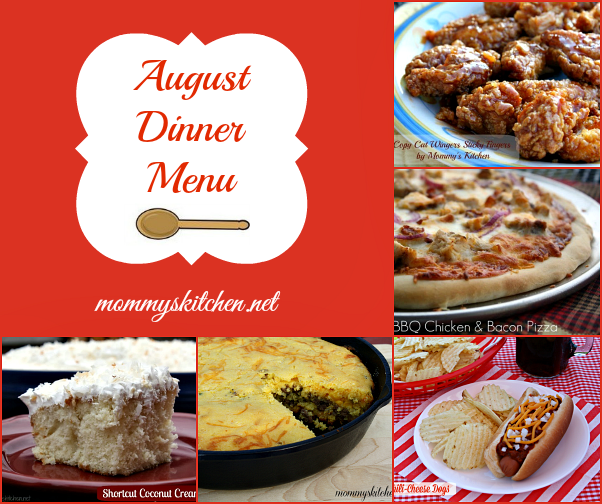 For more meal planning ideas check out my list of Monthly Menu Plans on Mommy's Kitchen. I do good when I manage my meals by a week at a time and then at times at a loss on what to prepare.